Good for countries with 220 volt outlets only - for other countries appropriate voltage converter is required - see more below. DO NOT BE DETERRED by the 220 Voltage - simple remedy - purchase additionally Simram SMF-100 Universal 100W Travel Converter for Both 110-Volt and 220-Volt from $8 to $15.99 only, (price may vary; not sold online from our store - coming soon) suitable for any trips and countries worldwide. Weight Reducing Belt (L) is designed to help you lose weight and form a beautiful shape. It is controlled by a minicomputer system and integrates an intelligent control, choice of heat and vibration massage therapies. It can be worn around the waist, neck, legs and arms and it massages with regulated heat, multiple rubbing balls and strong vibration - the quake can get down to 3-5 centimetres under the skin. 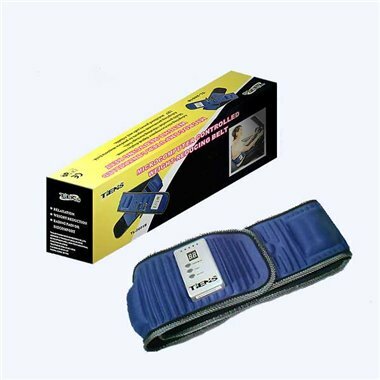 This speeds up blood circulation to eliminate fatigue, chronic waist pains and muscle aches. It helps to burn fat cells and increases their metabolism, to help shape the waist. The points magnetic wave breast enhancer can potently massage and stimulate the three main points of a breast (Qimen, Tianchi, Shanzhong), consequently accelerating the blood circulation, promoting galactophore growth, improving the flat and flabby breast, which brings round and upright breast curve, make you become a woman with beautiful curves. It dislodges excessive fats in the body and protects the body from obesity. It encourages easy digestion of foods by stimulating lazy intestines and facilitates excretion of waste products and pollutants from the body. It improves micro cycling, for brighter and more beautiful skin and a stronger, slimmer figure. It smoothes pregnancy wrinkles, stimulating galactophore to develop an elegant shape. It stimulates and improves mammary glands and breast increase without side effects. The built-in magnets help to adjust the balance of the “Human Life Force Energy” in your body. It reduces the sizes of the arms and thighs and makes bellies and waistlines firmer and flatter. Humanized point magnetic wave breast massager. Integrates machinery technology, electronic technology and biological technology organically. The product has five internal high speed driving fat crushers and eight fat crushing modes can generate strong mechanical movement which gets into the deep fat layer. Twenty super-strong magnets generate the netty line of magnetic force which penetrates and acts on the deep fat layer with the purpose of deep-seated degradation. Adopts the electronic technology can conduct thin and soft low-frequency current to the skin via special electric silica gel sheets, stimulating the points, motor nerve and up to deep-seated muscle motor cell of contact part by imitating human body natural nerve signals, which accelerates blood circulation and increases the density of muscle. Forbid using it in a wet or flammable area; put it in a dry area which breeze ventilates. Pregnant woman and infant are forbidden to use it; patients with the severe or special disease must consult the physician before using it. Don’t dismantle and repair it by yourself.